The Mega Drive is generally considered to be starved of good RPGs so is there a reason why 'Land Stalker' is so often overlook? Ten years ago Sony published a quirky puzzle game called 'Echochrome'. It was released on the PS3 and PSP and gameplay involved the manipulation of a virtual environment to take advantage of optical illusions. Spatial awareness was not required because if a platform looked like it was above another, characters would interact with it as if it were. Similarly, if discontinuous platforms appear, from the chosen camera angle, to form a continuous path, the character will traverse from one to the other. While it is complicated (and hard to briefly explain) 'Echochrome' was enjoyable because it took advantage of a player's limited understanding of a 3D game environment. It worked because our comprehension of a virtual world can be distorted by what we see. However the reasons it was enjoyable are the very same reasons that ruin 'Land Stalker'; a game that would otherwise be remembered as one of the finest 16bit RPGs. Executive producer Kan Naito was not a fan of the Mega Drive's primary input device. "I thought the Mega Drive controller was very difficult to use, it was too easy to accidentally make oblique movements. So with 'Land Stalker’ I created a control interface specifically to turn a disadvantage into an advantage". As a result of this, 'Land Stalker' is presented in isometric. Of course this decision makes the game look pretty and it wouldn't hinder enjoyment were this a straight RPG. Indeed 'Super Mario RPG' and 'Shadow Run' have similar viewpoint and these are often cited as people's favourite Snes Role Playing Games. It is a problem when you start jumping about however and that's something you end up doing a lot in 'Land Stalker'. The game's own instruction book even admits that the viewing angle presents a real problem to players. It notes "'Land Stalker' introduces a new form of perspective to the Role playing game. Because of the new angle and the three dimensional effects it has become much harder to gauge where to jump. If a platform is moving observe it carefully from a safe place. Plan all of your moves in advance...and keep trying". An isometric projection has no scaling, so things close up are identical in size and proportion to things far away. It was a short coming Super Play magazine once called “the dreaded isometric ‘optical illusion’ problem – it’s not always easy to tell where platforms and treasure chests suspended in the air are supposed to be”. It’s easy to appreciate how frustrating this makes 'Land Stalker'; a game which frequently demands you string a number of jumps together across moving platforms that are sometimes off screen. Admittedly the aforementioned 'Super Mario RPG' has platforming sections at the request of Mario's creator Miyamoto. However the saving grace in this game is the character's shadow. From the moment Mario leaps to the second he touches the ground, a player knows where the avatar is owing to the black circle that exists directly below his feet. It's amazing how such a small thing can make a big difference. However, without shadows 'Land Stalker' poses a real danger to controllers; playing it creates a huge desire to throw them against a wall in frustration. While it was initially designed because Kan Naito would press up/left more than up I found The Mega drives controller aggravate the problem. Movement is restricted to the four directions dictated by that perspective, so it's impossible to move directly up or across the screen. It feels all rather unnatural to play on a d-pad but feels less restrictive with a joystick. This may be why Contemporary reviewers were so critical of the game when it was digitally re-released. When Eurogamer looked at the Virtual Console version (twenty years after original release) they found 'Land Stalker' nearly unplayable. "It's the isometric view that really harms the game" Dan Whitehead said. "Accurate jumping is almost impossible as nothing casts a shadow, and benign amusement is soon replaced by confusion and frustration as you're asked to perform increasingly impossible feats of 3D navigation despite not being sure where you're going to land." Similarly game spot found fault. 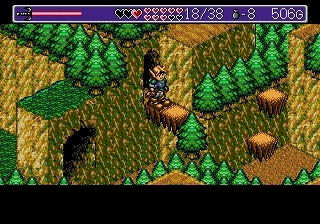 They believed 'Land Stalker' was disappointing "with its cumbersome controls and frustrating platforming, all of which is exacerbated by an isometric perspective. The result is a lengthy, memorable adventure that, sadly, might be memorable for the wrong reasons for those who are easily flustered." Both reviewers seem to echo the thoughts of critics in 1993. "At times I find that the odd perspective employed is confusing" reviewer Paul Glancey said in Mean Machines magazine. "Platforms that appear in one location may lie in another. Pitfalls often prove lethal [and] this becomes a bit irritating." However this same reviewer notes that "Other than that, the game is a marvel." Dozens of magazines seemed to agree with this opinion. Game Fan magazine gave it a near perfect 99% score saying the developer "gets a standing ovation for this playable masterpiece". So what was it that made the game so great? "'Land Stalker' is made a classic by the involved plot that surrounds your adventuring. The story adds another dimension to exploring the vast dungeon areas" reviewer Angus Swan once said. "The more you play, the more you realise this is by far the best adventure game on the Mega drive." Proving that not all heroes have heroic names in 'Land Stalker', you play as Nigel. He bares more than a passing resemblance to another pointy-eared adventurer who looks good in green. Much like Link, Nigel has a fairy friend named Friday. She insists that with her help, Nigel can find the fabled treasures of King Nole. According to the back of the box "eons ago evil King Noel tyrannised the mystical land of Melcatle. With an insatiable greed for power and wealth he crushed the people with heavy taxes while destroying their freedom. At last, in fury, the enslaved citizens storm the palace but King Noel was gone. And with him the vast treasure stolen from his subjects! Now Nigel, the Land Stalker, journeys to the fantastic realm in search of the legendary fortune and power to reunite a divided Kingdom". It's a simple premise that doesn't really get much deeper but short snappy dialogue helps to move the 25 hour adventure along. "The interaction between characters is always entertaining with a great line in humour supplying light relief on occasion" believed Glancey. Nigel and Friday make quite the comic double act and 'Land Stalker' does not shy away from snide remarks and innuendo that would never exist in a family friendly Nintendo made adventure. 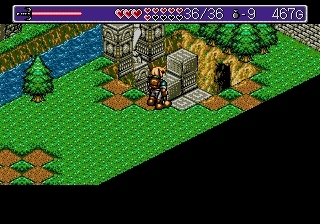 The same can't be said about the visuals though which are certainly inspired by the world and characters of Hyrule. "I wanted to realise my childhood dream of exploring a vast diorama world" justifies programmer Kan Naito. 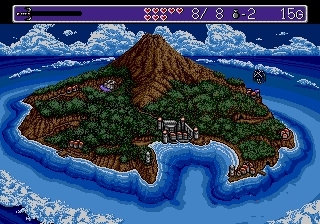 The game world is presented in bright, colours that seem to be using a palette far larger than thought possible on the Mega Drive. It was all made possible by a purpose made graphics engine called the DDS520 (Diamond Shaped Dimension System). "It took so much time to develop because there was no other game with large isometric worlds to draw from and I nearly gave up on seven occasions thinking maybe I'm trying to do something impossible with the hardware" recalls Naito. "Everyone knew deep down the Mega Drive couldn't outperform the Snes. It was the underdog in terms of graphical and audio power. Developers had to work hard to get great results" notes gaming historian John Szczepanaik "The CPU just wasn't equipped for the task. In contrast the Famicom, had a custom CPU designed specifically for the console" remembers Naito. 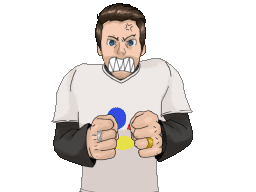 "I used to complain quite impertinently to Sega bosses about this. I'd say things like "We'll lose to Nintendo unless the mega Drive has custom hardware!"" Despite the systems limitations 'Land Stalker' offers large detailed character sprites rich in animation. The limited Meta Drive colour palette means that some backgrounds are slightly monotonous and garish, but it doesn't destroy the overall charm. The music is perhaps more remarkable if only because it's so different to the sharp Metallic boisterous music that so typifies Mega Drive games. While the sound effects are distorted repetitive and irritating the upbeat fantasy melodies wouldn't be out of place in a Nintendo game. The over world map theme is particularly memorable and certainly inspired by the works of Nobuo Uematsu. Like the 'Final Fantasy' musical director, 'Land Stalkers' composer Motoaki Takenouchi studied Music Composition at the Tokyo National University of Fine Arts and Music. Here he was under the supervision of composer Koichi Sugiyama, a legend of the industry that's frequently referred to as the "big boss of game music". It isn't surprising that 'Land Stalker's music has a robust epic feel given that the composer's mentor wrote the scores for early 'Dragon Quest' games. As this is an action rather than turn based RPG there's a focus on combat. While the enemies have a much greater reach, Nigel cuts swift, wide swaths with his sword. However it soon gets repetitive as there aren't really enemy patterns to learn which limits the variety of ways you need to approach combat. You’ll typically be doing the same thing repeatedly; attempting to disperse the enemies to take them on individually. Of course, enemies respawn continually, but given they drop loot this isn't necessarily a bad thing. 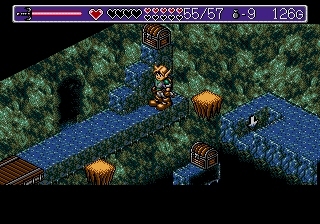 Unlike other Japanese RPGs, ‘Land Stalker' forgoes the traditional experience system for levelling up and instead focuses on treasure accumulation. With this wealth Nigel is able to buy hearts which both improve his attack power and overall life. As per the traditions of the genre, Items, equipment and weapons can also be bought. However as there are no item descriptions on the menu screens you'll need a good memory to remember what each does. 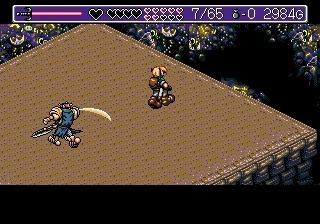 With many of the puzzles being simple block pushing, and the combat requiring little more than button bashing, much of the game's challenge comes from hunting for the items you need to progress. However, I frequently missed key items and important townsfolk because they were hidden behind bushes in the foreground. It's yet more evidence that what would have been a great adventure has been tarnished by the choice of visual presentation. 'Land Stalker' certainly isn't a bad game. While light on story the game remains engaging for the 25 hours it takes to complete. That being said probably a third of the playtime is spent attempting then retrying the platforming sections. It really is a shame that Kan Naito couldn't use a controller because this short coming has really destroyed what should have been his greatest game. I have little doubt that if 'Land Stalker' were a top down viewed RPG it would still be held in high esteem, maybe even eclipsing 'Phantasy Star IV' as the greatest on the Mega Drive. Thankfully the jump button was removed from the sequel 'Lady Stalker' but this concession was obviously too late to save this game. "Fans still request new titles in the 'Land Stalker' series even today" admits Kan Naito. They very nearly got their wish as A PSP remake of 'Land Stalker' was around 40% complete before cancellation. It apparently had a rotatable view and real time shadows but tragically we'll never see if these additions would have been enough to rescue what should have been a very good game. "'Land Stalker' would be an incredible game in 3D, but it has a lot of stuff that looks 3D that are actually 2D" Sega's creative producer Yousuke Okunari once said. "Some games work well in 3D and some don’t". Evidently sprite based action RPGs are one sub-genre that should have remained two dimensional. With its awkward forced perspective and terrible jumping sections 'Land Stalker' remains a game where one odd development decision has ultimately meant it's vanish into obscurity. Proving that true friendship is possible despite distance, one of my closest friends shares a passion for Retro gaming and RPGs in particular. For Christmas this year she got on 'Land Stalker'. To be honest I didn't really know much about the game and it's been a journey of frustrating discovery for me. Despite this I will always be very much appreciative. This is one of my favorite games of all time, so I am biased, but I thought the controls were only a learning curve and once you get into it I forget that there are any troubles involved with the controls. The jumping can be a bit "try till you figure out" but in the history of random mechanics in video games at that era and before, I don't really feel like it ruins what is a beautiful and unique game. Thanks for the detailed reviewed. I really enjoyed this game in my youth and always looked at the controls as part of its charm.